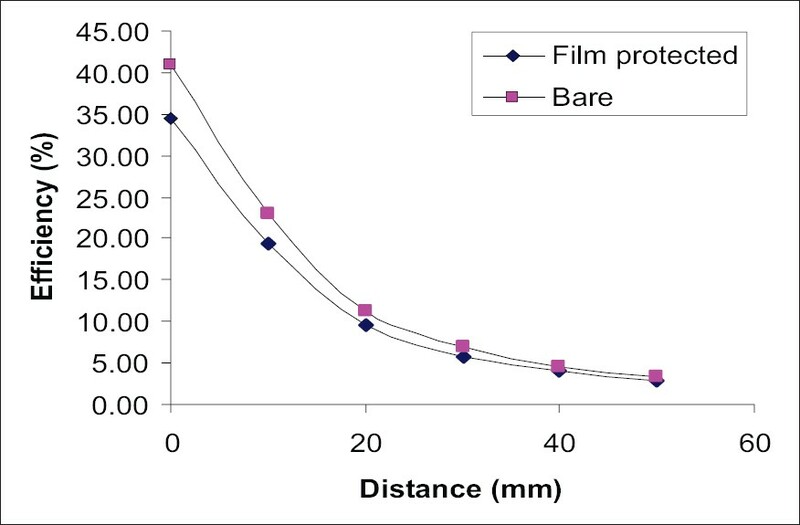 Radiation dosimetric methods are used for the estimation of dose absorbed by radiation in a detector material. These methods are required for estimation of absorbed dose in various applications of radiation, such as personnel and environmental dosimetry, retrospective/ accident dosimetry and medical applications of radiation. The use of thermoluminescence (TL) as a method for radiation dosimetry of ionizing radiation has been established for many decades and has found many useful applications in various fields, such as personnel and environmental monitoring, medical dosimetry, archaeological and geological dating, space dosimetry. Several high sensitivity TL phosphor materials and thermoluminescent dosimeters (TLDs) are now commercially available in different physical forms. There are many commercial TLD systems which are being used for various dosimetric applications and even presently, TL is a major player in the field of radiation dosimetry, particularly in personnel dosimetry. In the last two decades an alternative technique, optically stimulated luminescence (OSL), has been developed, as the optical nature of the readout process does not involve problems of blackbody radiation and thermal quenching. Due to this and some other advantages OSL is also being used for various applications in radiation dosimetry, such as personnel and environmental dosimetry, retrospective/ accident dosimetry and medical dosimetry. The development of Al 2 O 3 :C TL/OSL phosphor by Akselrod et al. 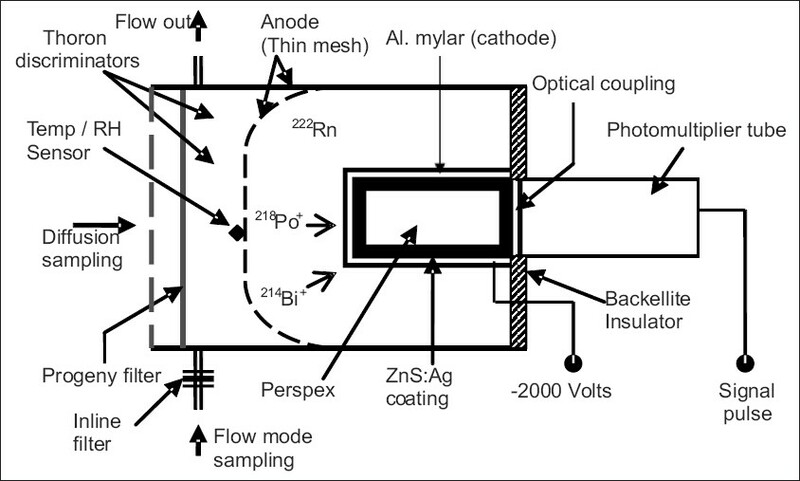 and later investigation of its suitability for personnel dosimetry using pulsed OSL (POSL) technique of stimulation by Akselrod and McKeever, resulted in the development of a personnel dosimetry system based on Al 2 O 3 :C OSL phosphor. Therefore, thrust of modern luminescence dosimetry development is more towards OSL. The main advantages of the small size optic fiber based OSL dosimeter over the currently available radiation detectors, such as TLD, used in clinical applications, are the capabilities of measuring both real-time dose rate (using radioluminescence, RL) and absorbed dose (using OSL). Although radiophotoluminscence (RPL) dosimeters were developed in parallel with TLD systems during 1960s, but high pre-dose and photon energy dependent detector material prevented major breakthrough of the glass dosimetry. Therefore, RPL glass dosimeters were used as an emergency dosimeter in accident situations. However, in mid 1980s introduction readout systems using a pulsed UV stimulation, in place of conventional mercury UV lamps, helped in reducing pre-dose by a factor of 100 (from mSv to a few μSv). Use of pulsed stimulation permits electronic discrimination of the signals from the pre-dose and absorbed dose on account of their different fluorescence decay times. This development resulted in the manufacture of improved RPL glass dosimeters and fully automatic RPL reader systems capable of measuring doses in the range 10μSv to 10Sv. In 2001, silver activated phosphate RPL glass dosimetry system has been introduced as the major personnel monitoring service in Japan marketed by Chiyoda Technol Corporation. Some of these developments in the field of TL, OSL and RPL dosimetry are reviewed. 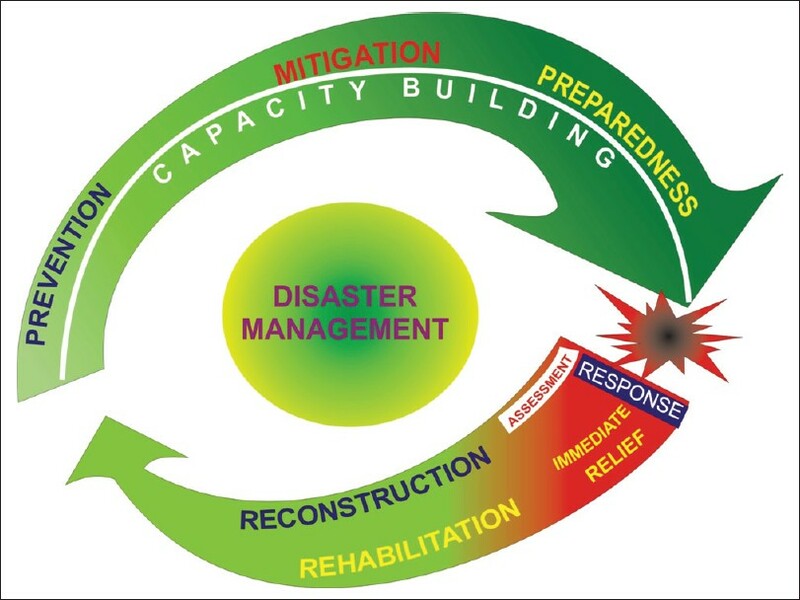 The National Disaster Management Authority (NDMA), ever since it's formation as an apex policy making body for the country in the field of disaster management, has formulated a set of guidelines to assist the various ministries, states and stakeholders in preparing their plans to handle different types of disasters. The guidelines on management of nuclear and radiological emergencies assume great importance in the present context, as our country has very ambitious programme to exploit nuclear energy for peaceful uses. Though, we have an enviable and impeccable record of safety and virtually fail-safe operations in all our nuclear establishments, the possibility, however, remote it may be, of human error, systems failure, sabotage, earthquake, floods, terrorist attacks etc leading to the release of radioactive material in the public domain, cannot be entirely ruled out. With this view, it was decided to prepare the national guidelines by NDMA to manage any nuclear/radiological emergency in public domain. Through these guidelines, we aim to further strengthen our existing nuclear/radiological emergency management framework and generate public awareness, which will go a long way in allaying misapprehensions, if any, amongst the public about the country's nuclear programme. Like in all our guidelines for handling of different types of the disasters, in these Guidelines also, maximum emphasis has been laid on the prevention of nuclear and radiological emergencies, along with a detailed consideration of all other elements of the disaster management continuum. The National guidelines have been prepared and a consensus was arrived on various issues, after wide-spread consultations and elaborates discussions amongst experts as well as stakeholders. It is assumed that once these guidelines are implemented by the stakeholders and converted into action plans followed by SOPs that will further reduce the chances of accidents in the nuclear arena. A case study was undertaken to resolve the problem of high background counts of annealed TLD cards at one of the TLD Laboratory observed during handling the over exposure report (OER) received from various accredited laboratories for Non-DAE institutions. 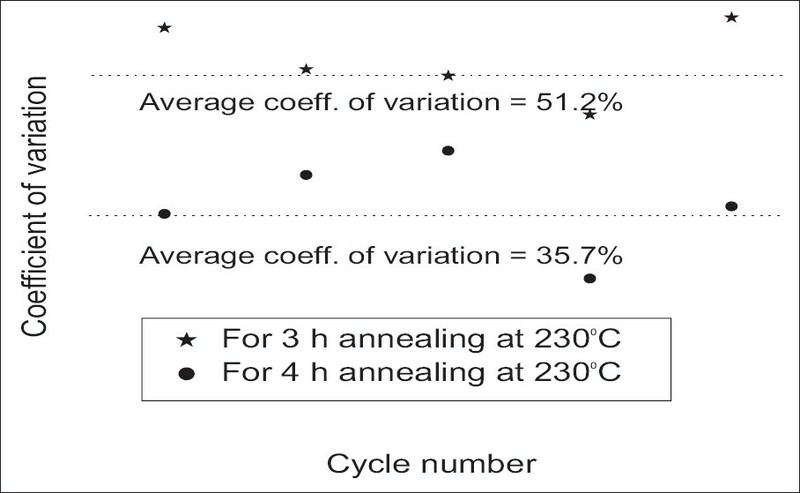 In order to verify the appropriateness of annealing procedures adopted by the Laboratory, a detailed study was conducted using four sets of cards exposed to various dose levels. It was found that inadequate annealing time than the standardized protocol duration of 4h at 230°C leads to larger standard deviation and enhanced background, which may slowly build up with repeated use and result in rejection of the dosimeter from field use. Hence it is recommended that annealing procedure of TLD cards must be strictly followed as per standardized protocol. The daily dietary intake of strontium and it's content in blood serum for Indian adult population were estimated experimentally by measuring the concentration of stable Sr in total cooked diet and blood serum samples using radiochemical neutron activation analysis technique (RNAA). This paper reports some preliminary results obtained in the estimation of gut absorption factor (f 1 ) values of Sr in Indian adult population using data on it's daily dietary intake and blood serum content. The estimated f 1 values of Sr in Indian adult population were compared with the reported ICRP values. 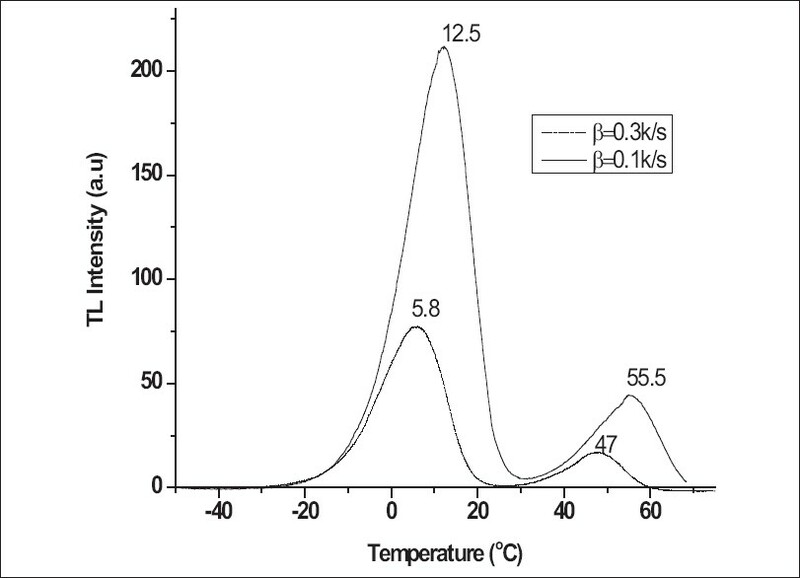 Commercially available and indigenously developed single crystal α-Al 2 O 3 :C (using Post growth Thermal Impurification (PGTI) technique), were studied for their thermoluminescence (TL) response in the temperature range from -100 o C to 60 o C. Both types of samples were found to possess similar pattern of TL peaks. In PGTI samples, a dominant TL peak occurred at 8 o C and commercial reference samples showed an intense TL peak at 12.5 o C. The results indicate that the nature of shallow traps formed using PGTI method is qualitatively analogous to those created by conventional method of growing single crystal α-Al 2 O 3 :C in vacuum in graphite ambience. The low temperature TL peaks are found to respond to blue light optical stimulation as well and therefore may play a crucial role in real time OSL radiation dosimetry in the regime of low temperature ambient conditions, especially with improved detection threshold. Highly transparent single crystals of Li 2 B 4 O 7 i.e. lithium tetraborate (LTB) doped with Cu (0.25 wt. %) and Cu & In (0.5 wt. % each) were grown by the Czochralski method. 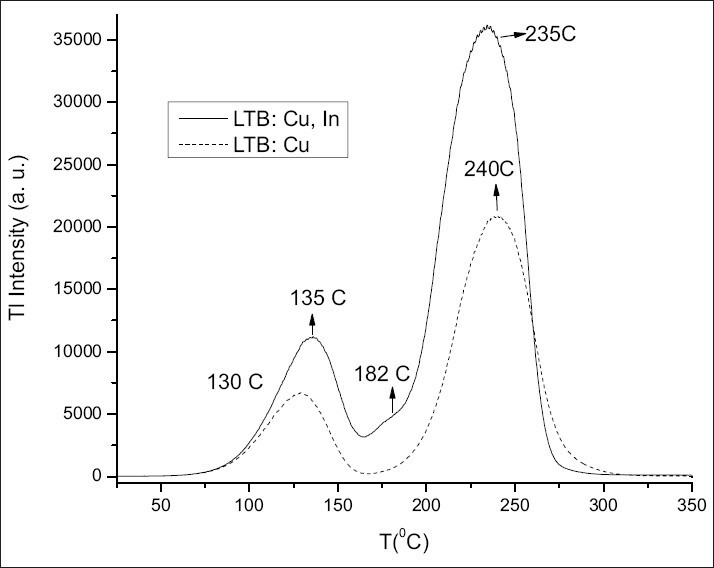 The Li 2 B 4 O 7 : Cu and Li 2 B 4 O 7 :Cu, In crystals were studied using thermoluminescence (TL) technique. The TL readout of Li 2 B 4 O 7 :Cu crystals showed two well-defined glow peaks at 130 o C and 235 o C for heating rate of 4K/s, whereas in LTB:Cu, In another shoulder peak on low temperature side of the main peak is seen. The TL sensitivities of LTB:Cu and LTB:Cu, In were found to be 3.3 and 6 times to that of TLD-100 respectively. Both the LTB:Cu and LTB:Cu, In crystals exhibit a linear TL dose response in the dose range from 1 mGy to 1 kGy. The single crystal of Li 2 B 4 O 7 : Cu,In could become a potential TL phosphor for medical and clinical dosimetry owing to its very good sensitivity and excellent tissue equivalence. Cu + was doped in fused quartz using simple technique and the OSL and TL was studied. The doped quartz shows enhanced TL as well as OSL sensitivity. 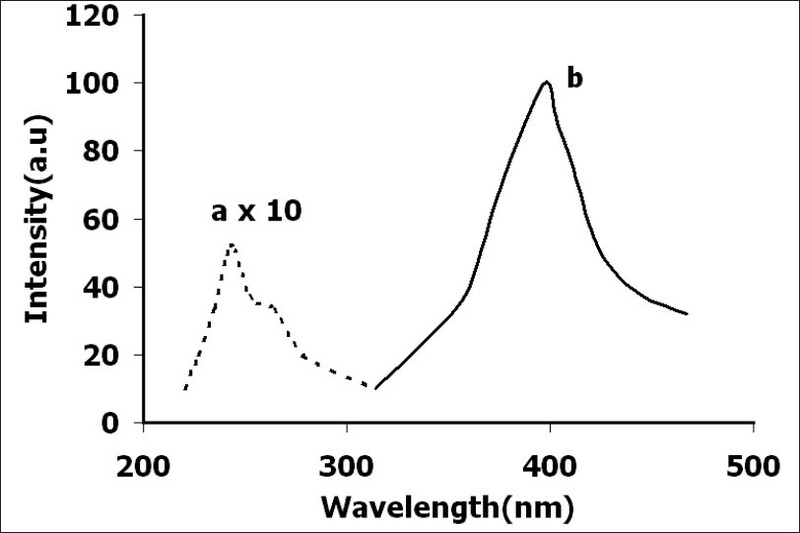 Its OSL sensitivity is 0.33 of Al 2 O 3 : C (Landauer Inc., USA) with blue light (470 nm) stimulation. Since natural quartz is being used for archaeological dating due to its good retentivity of the stored signal, doped fused quartz will be a promising phosphor for its use in radiation dosimetry using OSL technique. There has been a long standing demand for online monitoring of radon level in various locations of underground Uranium mine for taking care of radiological protection to workers. Nowadays, radon ( 222 Rn) monitors, based on electrostatic collection of charged progeny and subsequent detection by semiconductor detector are increasingly employed for radon monitoring in environment. However, such instruments have some limitations such as (i) requirement of additional dryer since sensitivity is dependent on the humidity, (ii) cannot be connected to a network and (iii) not cost effective etc. Hence use of such instruments in underground uranium mine (humidity level >90), may not be reliable. Towards this end, we have indigenously developed radon monitor based on electrostatic collection and scintillation technology for the online monitoring in uranium mine. This instrument overcomes the above mentioned limitation of commercial radon monitors and based on custom made features. Different tests and measurements were carried out and compared with commercial instruments. It was found to be in an excellent agreement with the commercial instruments. A few such instruments have been installed in different locations of uranium mine at Turamdih and connected to a network system for online monitoring and display. 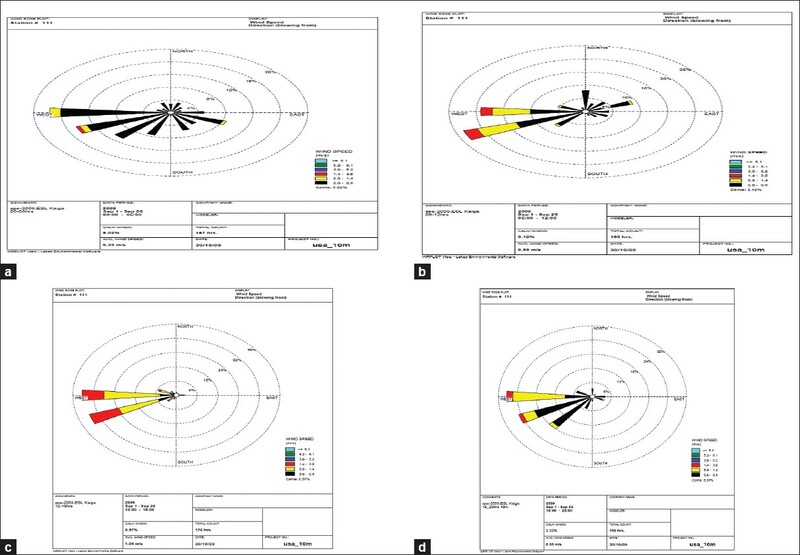 This paper presents the features of a recently developed ground surface contamination monitor based on wide area plastic scintillation detector and investigates the design and performance characteristics of the system. The system incorporates an innovative methodology for suppressing the general background radiation influence on the detector response. 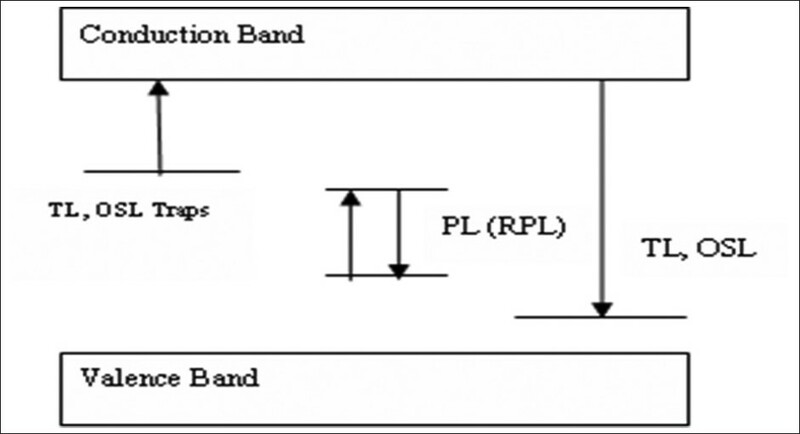 The methodology involves the incorporation of a suitably positioned gamma sensitive Geiger Muller tube, the output of which is used to compensate for the general background interference in the response from the plastic scintillation detector. This paper reports on the performance evaluation of the system and the parameters considered for setting the alarm levels. CR-39 is the most sensitive of nuclear track detectors for protons and is recommended as an effective neutron dosimeter because of it's low threshold energy of 100 keV neutrons. The fraction of protons that gives detectable tracks in CR-39 depends on the energy of the proton angle of incidence and etching conditions. As a consequence the registration efficiency of neutrons in the CR-39 plastics used for neutron personnel monitoring is strongly influenced by the direction of radiation incidence. This paper presents the relative response of CR-39 at varying neutron incident angles, for 241 Am-Be neutron source spectra in free air and on ISO phantom, in terms of operational quantities. 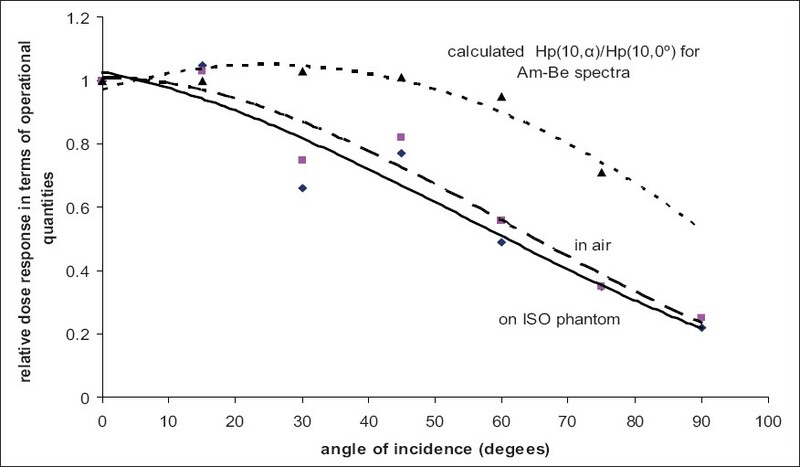 It is observed that the angular dependence of CR-39 for irradiations in air and on phantom is essentially the same indicating that the phantom does not affect the directional response of CR-39. The increase in the usage of radioactive sources in various fields and the present scenario of adopting various means of terrorism indicates a possible environment for malicious usage of radioactive sources. Many nations, India inclusive, have to strengthen further it's capability to deal with Nuclear/Radiological Emergencies. The probable radiological Emergency scenario in public domain involves inadvertent melting of radioactive material, transport accident involving radioactive material/sources and presence of orphan sources as reported elsewhere. Explosion of Radiological Dispersal Device (RDDs) or Improvised Nuclear Devices (IND) leading to spread of radioactive contamination in public places have been identified by IAEA as probable radiological threats. The IAEA documents put lot of emphasis, at national level, on training and educational issues related with Radiological Emergencies. The agencies and institutions dealing with radioactive sources have few personnel trained in radiation protection. Experience so far indicates that public awareness is also not adequate in the field of radiological safety which may create difficulties during emergency response in public domain. The major challenges are associated with mitigation, monitoring methodology, contaminated and overexposed casualties, decontamination and media briefing. In this paper, we have identified the educational needs for response to radiological emergency in India with major thrust on training. The paper has also enumerated the available educational and training infrastructure, the human resources, as well as the important stakeholders for development of sustainable education and training programme. 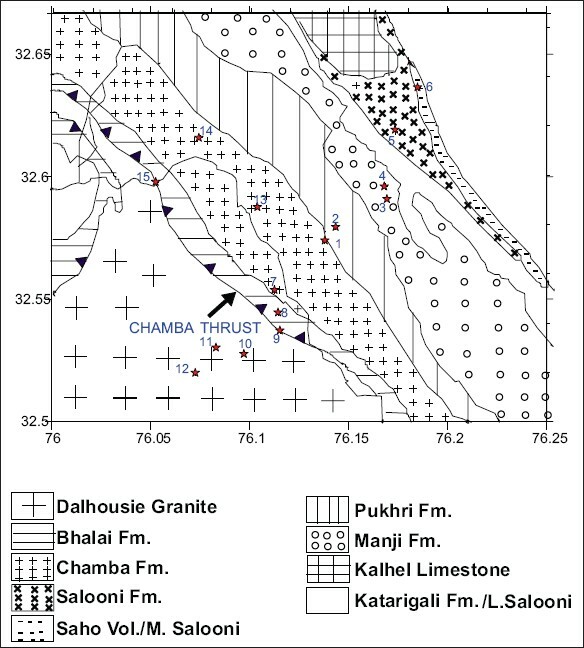 The paper discusses the result of systematic measurement of activity concentration of radon in ground water samples of seismically active areas of N-W Himalayas, Himachal Pradesh, India. Himalayan region is being subjected to intense neotectonic movements and seismic activities. For systematic study, the study area has been divided into three Zones on the basis of lithology and thrust systems of the area viz. Zone-I, Zone-II and Zone-III. Water radon concentrations were measured using RAD-7 equipped with an appropriate unit (Aqua kit) following a protocol proposed by the manufacturer. Water samples have been collected from the different sources and wide range of the villages from the Zone-I, II and III respectively. The radon concentration in water samples collected from Zone-I has been found to be varying from 8.4Bq/l to 314Bq/l with average value 61.2 Bq/l. The radon concentration in water samples collected from Zone-II has been found to be varying from 14.4Bq/l to 140Bq/l with average value 50.8 Bq/l. The radon concentration in water samples collected from Zone-III has been found to be varying from 9.3Bq/l to 77.8Bq/l with average value 23.2 Bq/l. 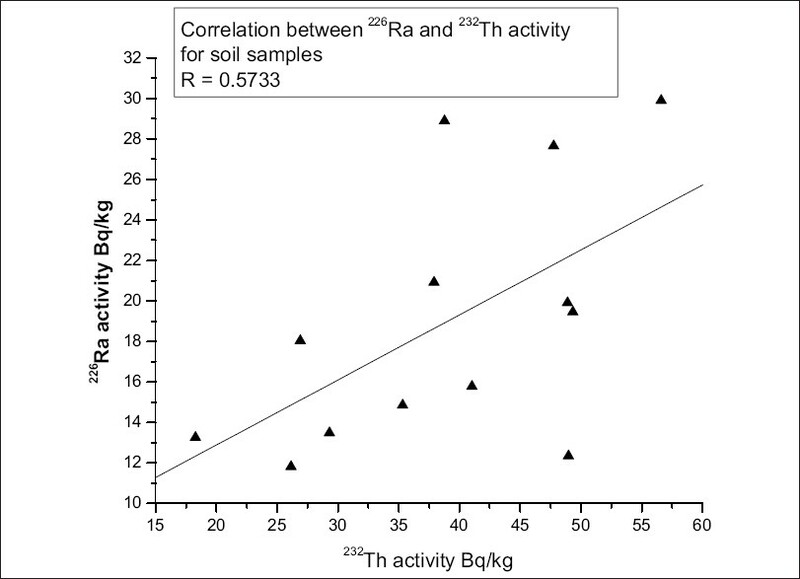 The natural radioactivity due to Radium, Thorium and Potassium in environmental samples such as soil and building materials contributes to the radiation dose received by human beings significantly. For assessing the environmental radiological impact to public it is essential to evaluate the activity levels of these nuclides. Using high-resolution Gamma ray spectrometry system the soil and few building material samples viz., granite, sand, brick collected from Shahpur region of North Karnataka were analysed and the radioactivity levels were estimated. The absorbed dose rate due to natural radionuclides was also calculated and the results are reported in this paper. The results obtained were observed to be normal in comparison with the World literature values for almost all samples whereas granite samples showed relatively higher activity and hence higher dose. 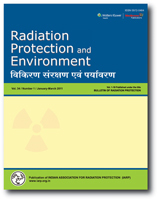 This study provides a baseline data of radioactivity background levels in the Shahpur region of Gulbarga district and will be useful to assess any changes in the radioactive background level due to various man made processes. This paper presents the results of estimation of ground level (10m) wind pattern at Kaiga site using ultra sonic anemometer for month of September. The study generated wind data at ground level for the month of September 2009. More than 70% of the wind is in a speed group less than 0.8m.s -1 , except during 12-18 h, and hence, cannot be measured by conventional anemometer or SODAR system. Present data clearly indicate that during September month, wind direction pattern observed at 10 m height at Kaiga site measured using Ultra sonic anemometer is comparable with that observed at higher sites using conventional wind monitoring system. This data will be extremely useful for understanding lower wind speed distribution which may not be possible to be measured with conventional wind measurement systems. This data will be extremely useful for understanding the pattern of environmental distribution of atmospherically released radionuclides especially, that of tritium, through forest canopy surrounding the site. This paper presents the results of 137 Cs content in soil samples around Narora Atomic Power Station using gamma spectrometric system. The transfer factors (TF) of different terrestrial matrices are also evaluated. It is observed that the range of 137 Cs content in Narora soil is 0.35 Bq/kg to 6.8 Bq/kg with an average value of 4.2 Bq/kg dry weight which is slightly higher than the literature value of different parts of country. The TF for different matrices are also been evaluated which show that the mean TF for fruit and vegetable is 1.62E-02 and 3.1E-02 respectively while highest TF amongst dietary items has been found to be in crop that is 4.49E-02. Milk is considered to be a complete food and an almost indispensable part of the diets of infants and children. 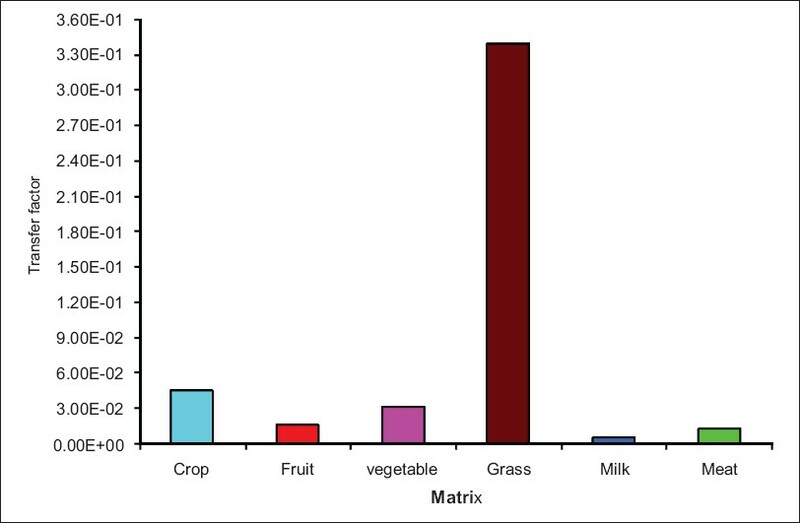 In this paper we present the concentration of some radiologically and nutritionally important trace elements such as Th, Cs, Co, Rb, Fe, Ca and Zn present in human milk and commercially available milk. The trace elements in human and other milk samples were determined using instrumental neutron activation analysis technique. The results show that higher concentrations of Th, Cs, Ca and Rb were found in ordinary milk samples in comparison with the human milk samples. Whereas, a higher concentrations of Fe and Co were observed in human milk samples. These data will be useful for the nutritional and biokinetic studies of these elements in infants and children of different age groups. The paper presents a microcontroller based automatic reader system for neutron measurement using indigenously developed superheated emulsion detector. The system is designed for real time counting of bubbles formed in superheated emulsion detector. A piezoelectric transducer is used for sensing bubble acoustic during the nucleation. The front end of system is mainly consisting of specially designed signal conditioning unit, piezoelectric transducer, an amplifier, a high-pass filter, a differentiator, a comparator and monostable multivibrator. The system is based on PIC 18F6520 microcontroller having large internal SRAM, 10-bit internal ADC, I 2 C interface, UART/USART modules. The paper also describes the design of following microcontroller peripheral units viz temperature monitoring, battery monitoring, LCD display, keypad and a serial communication. The reader system measures and displays neutron dose and dose rate, number of bubble and elapsed time. The developed system can be used for detecting very low neutron leakage in the accelerators, nuclear reactors and nuclear submarines. The important features of system are compact, light weight, cost effective and high neutron sensitivity. The prototype was tested and evaluated by exposing to 241 Am-Be neutron source and results have been reported. Bioassay monitoring of occupational workers handling uranium (U) is done by analyzing either overnight or 24 h urine samples. 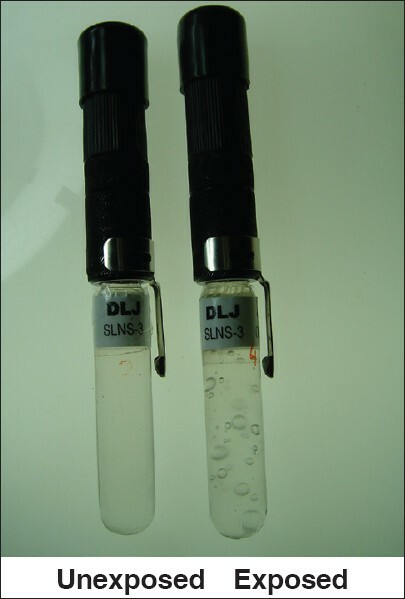 U content in these samples is determined by ion exchange technique followed by alpha spectrometry which has Minimum Detectable Activity (MDA) of about 40 ng for 1 d counting time. The need is to detect daily urinary excretion of 21 ng in case of Type S U(nat.) compounds, so as to record Committed Effective Dose (CED) corresponding to 1 mSv. 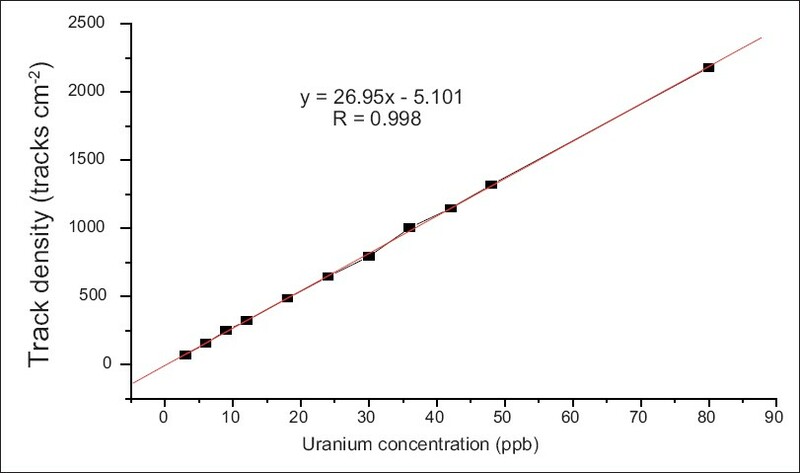 Fission track analysis (FTA) technique in solution media was therefore standardized using Pnuematic Carrier Facility (PCF) of Dhruva reactor for estimation of low levels U in bioassay samples. Chemicals are useful and indispensable in every walk of our life. Nuclear industry is no exception to this fact. A number of chemicals are in use in the nuclear fuel cycle. Thus, hazards due to exposure to chemicals coexist with radiological hazards in a nuclear fuel cycle industrial or research set-up. In the realms of control of chemical exposure, limits on concentration of chemicals in workplace are prescribed. These are known as occupational exposure limits. Threshold Limit Value (TLV) is one such occupational exposure limit. American Conference of Governmental Industrial Hygienists (ACGIH) prescribes TLVs as guideline values for various chemicals and also for physical agents. The discussion is confined to philosophy of chemical TLV, its applicability, and its limitations.